Anybody that reads my blog on regular basis must have noticed that I like tripes. Yup, I like tripes a lot! On my last visit to supermarket I passed by meat isle and the Styrofoam tray of tripes was so irresistible that I had to take it home. The second I laid my eyes on it I knew how I am going to cook it – Steamed Tripe Dim Sum. Actually, it is a trice cooked dish: boiled for 2 hours, then briefly stir fried and finally steamed. Lots of work for something that is inhaled in minutes, I have to say. One important note: Traditionally, this dish is done with book or bible tripes but since they are not available in my small town I have to use what I have. Blanch the tripes in plenty of boiling water for 3 – 5 minutes. Drain and wash the tripes and pot. In a same pot with fresh water place tripes, salt and vinegar and bring to boil on high. Lower heat to simmer and cook for 2 hours or till tender but still with some crunch left. Drain, cool and let dry. Previous steps can be done in one day and following 2 steps next day. When tripes are dry, heat a wok with a bit of oil and when hot drop in garlic, ginger, pepper flakes and white parts of green onions and stir fry briefly. Add tripes and stir fry till all ingredients are well mixed. Remove to steaming dish, place in a steamer, cover and steam for 20 minutes. 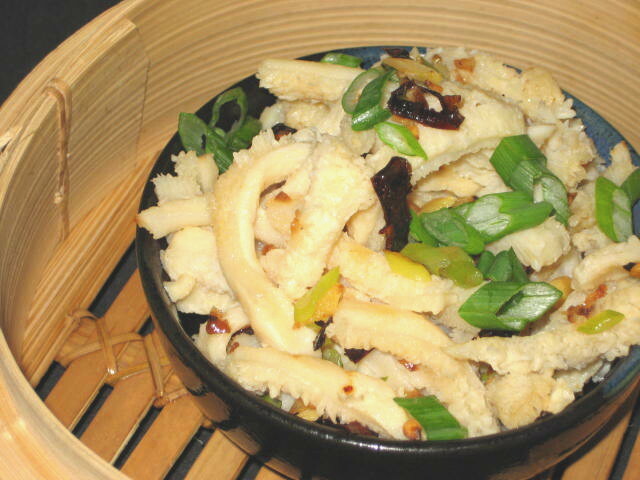 Serve with the bamboo steamer with green onions sprinkled on top of tripes. Happy Lunar Year of a Cat to Vietnamese friends and Year of a Rabbit to Chinese. Mind you, we have an issue with destructive rabbits in our garden!